Summer in Calgary is almost over. The indigenous poplars are starting to turn yellow and drop their leaves but the warm weather continues. It’s hot during the day with the temperatures ranging from 27 to 30 Celsius (81 to 86 Fahrenheit). Too hot to walk, at least for me, so I walk at 6 a.m. before the sun is up when the temperature is closer to 10 degrees (50 Fahrenheit). I’m trying to hit my 10,000 steps per day. This is important for a person who spends a lot of her time sitting at a computer. August has been a busy month. For the first time I attended a local conference for Readers and Writers, called When Words Collide. I liked it so much I am already signed up for next year. 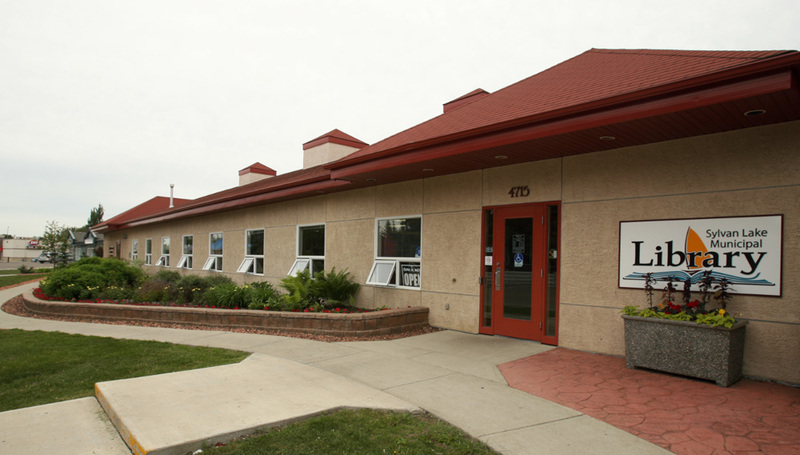 I also attended the Annual Sylvan Lake Retreat with thirteen other writers from Calgary and Edmonton and surrounding areas. We even had a writer there who came all the way from Keewatin Ontario. And, yay me, I finished my latest manuscript. My editor has it now. 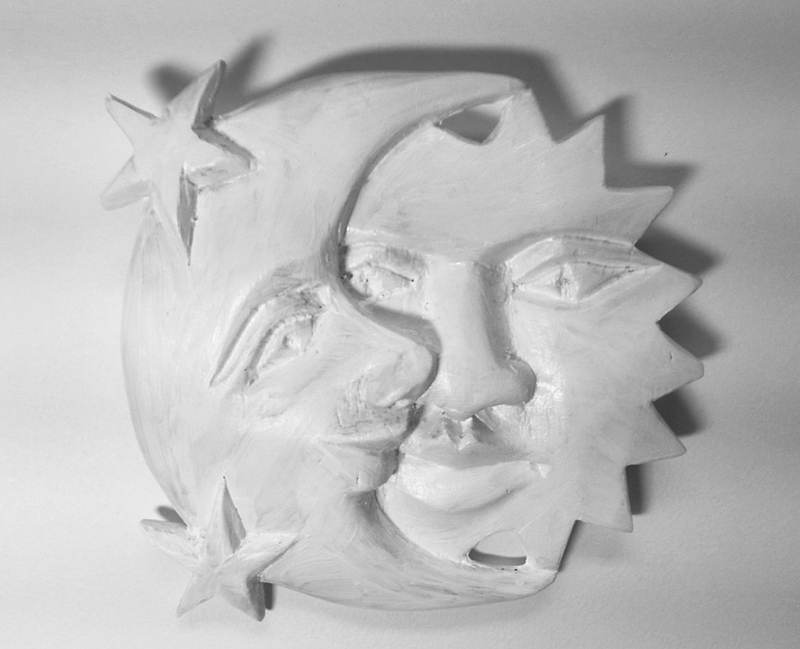 In the meantime, I am working with my cover artist and finalizing a design. I hope to have the book ready for October. This is the prequel to ON THE WAY TO A WEDDING that I’ve told you about. 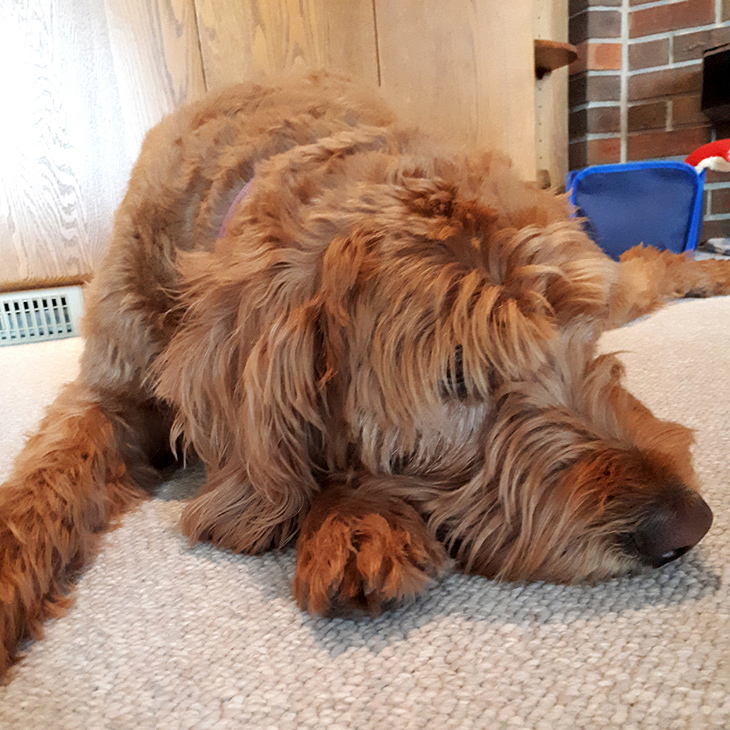 Also this month, Rolf and I got to doggie sit Makita for two weeks, while her humans were on vacation. 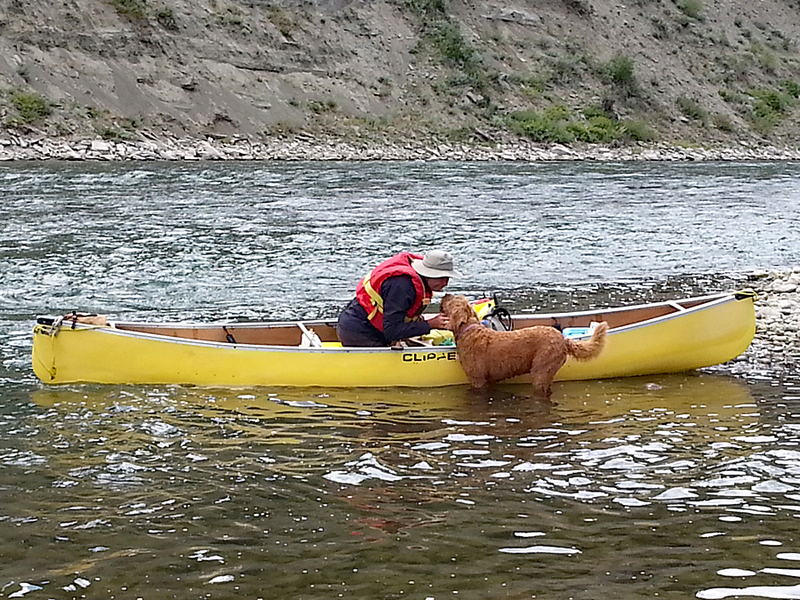 Here she is greeting Rolf at McKinnon Flats as he finishes a canoe trip on the Bow River. She is such a happy dog, but I know she missed her humans and she was happy to be reunited with them. We don’t have a cat because Rolf is allergic to them, but apparently cats have the same attachment needs as dogs. 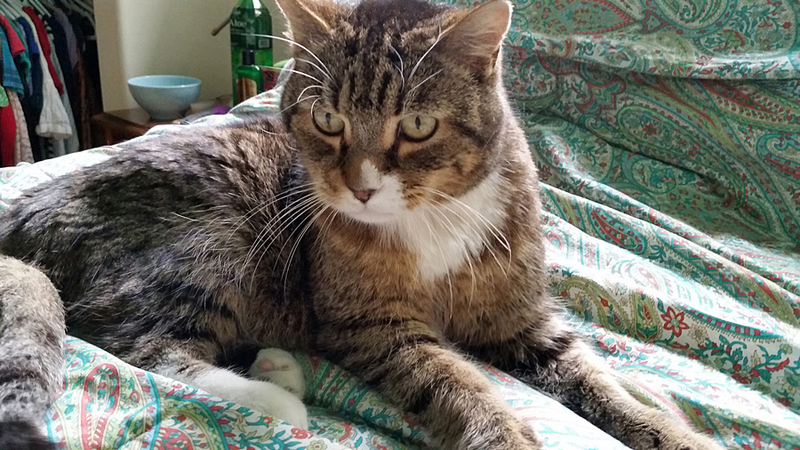 A friend of mine wrote a beautiful (and funny) article about her experiences with fostering cats. I think you’d enjoy reading it. You can find it here. 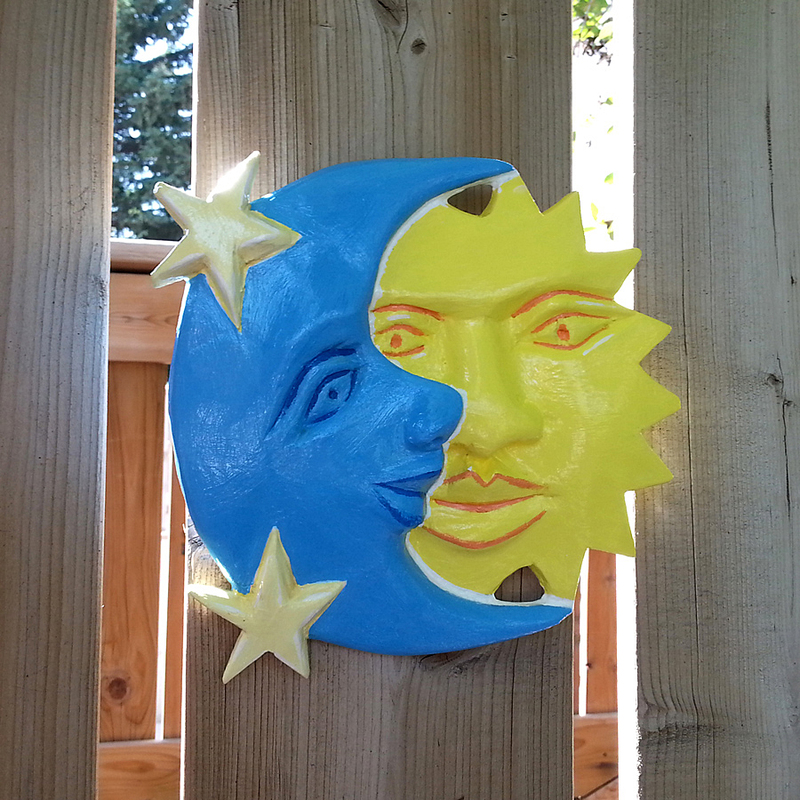 On August 21st, I watched the partial eclipse of the sun with my son Kyle. 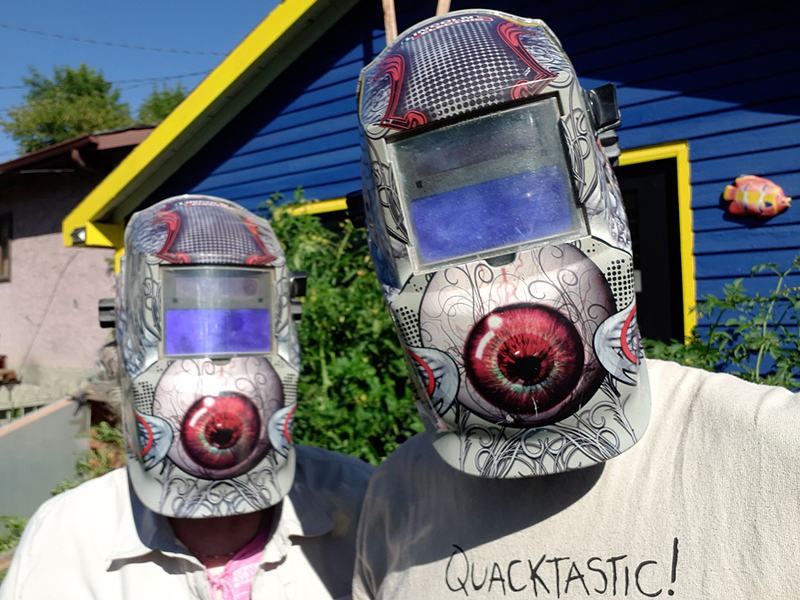 Here we are using his welding helmets. 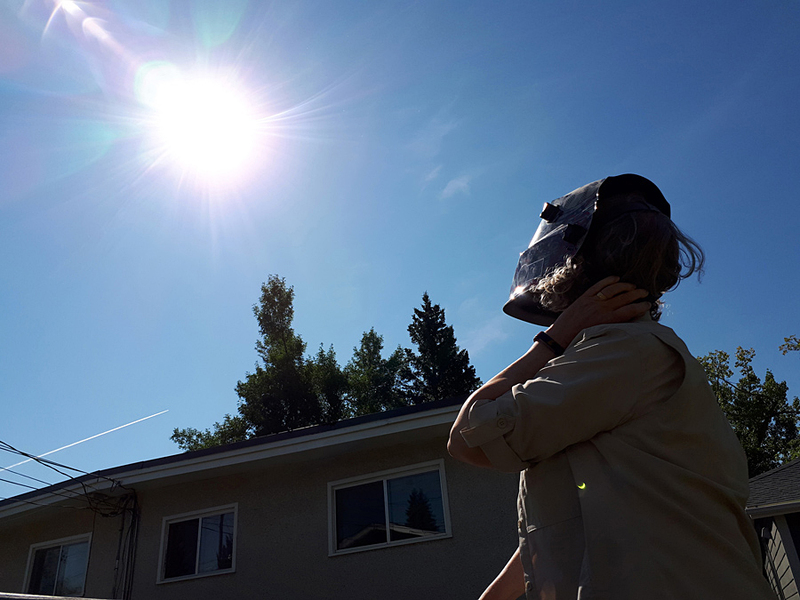 Kyle somehow managed to get this shot of me – watching the eclipse, with a jet stream in the sky, while he was holding the “pin hole” and reflecting the stage of the eclipse off my shirt. Pretty cool, eh? See the “pin hole” image of the eclipse on my shirt? As this month ends, I am edging into a new story. It will be book three of my Wedding series. 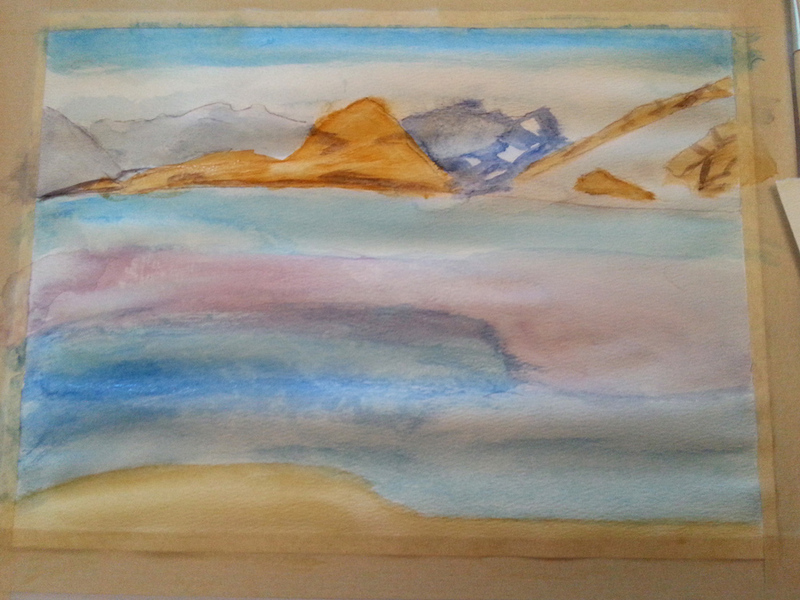 While part of my mind works on that in the background, I am taking a watercolour course. 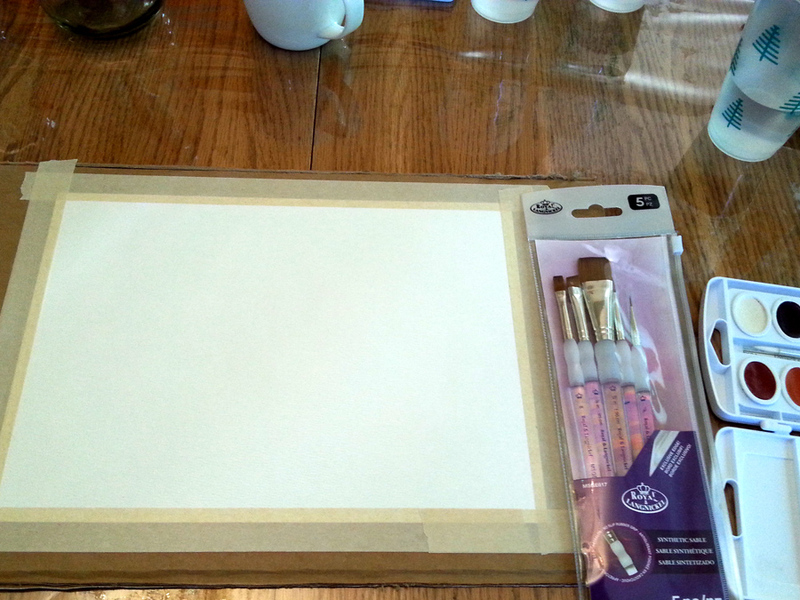 At this point, I am mostly learning about paints and brushes and papers. And I still enjoy playing with acrylics. 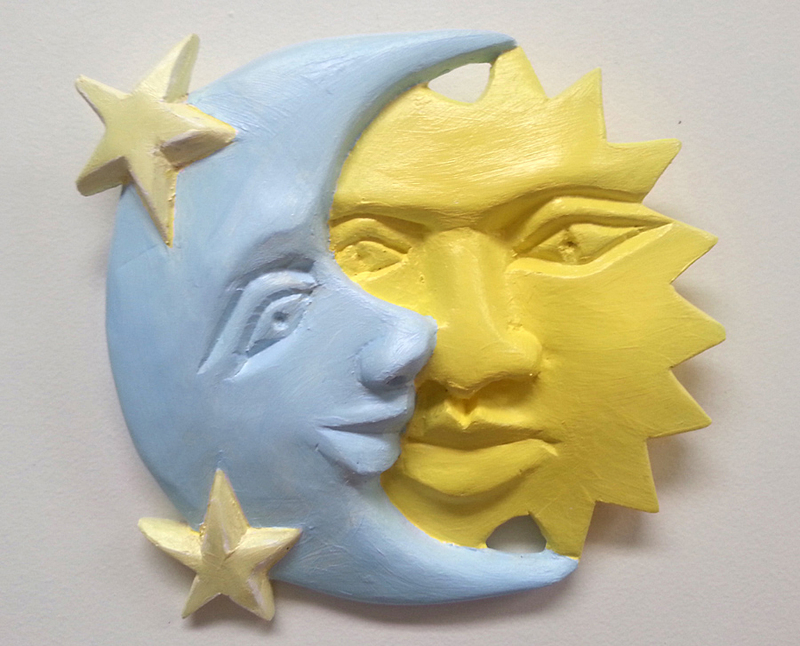 For no other reason than it seemed like fun, I decided to paint this Sun and Moon. Someone threw it out and I figured it could use some brightening. And of course one person’s trash is another person’s treasure . . .
paint the sun yellow and decide I don’t like it . 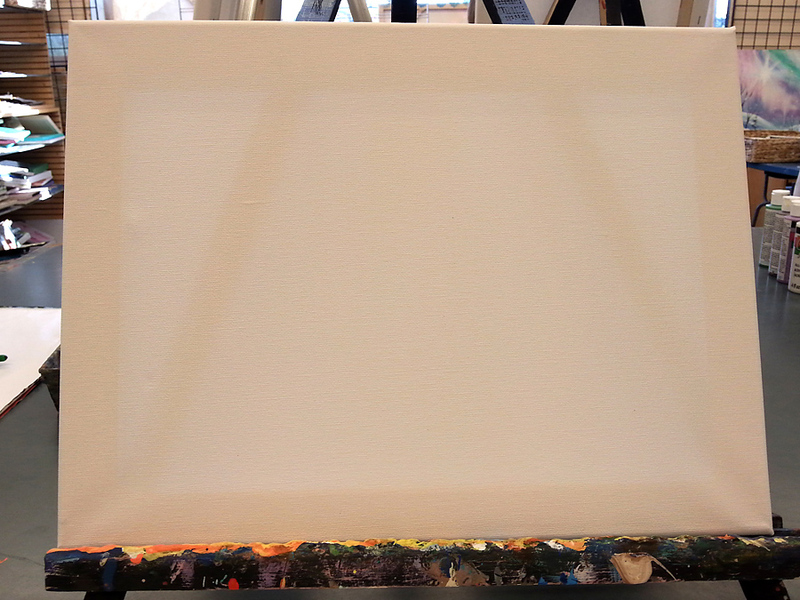 . .
so paint the whole thing white . 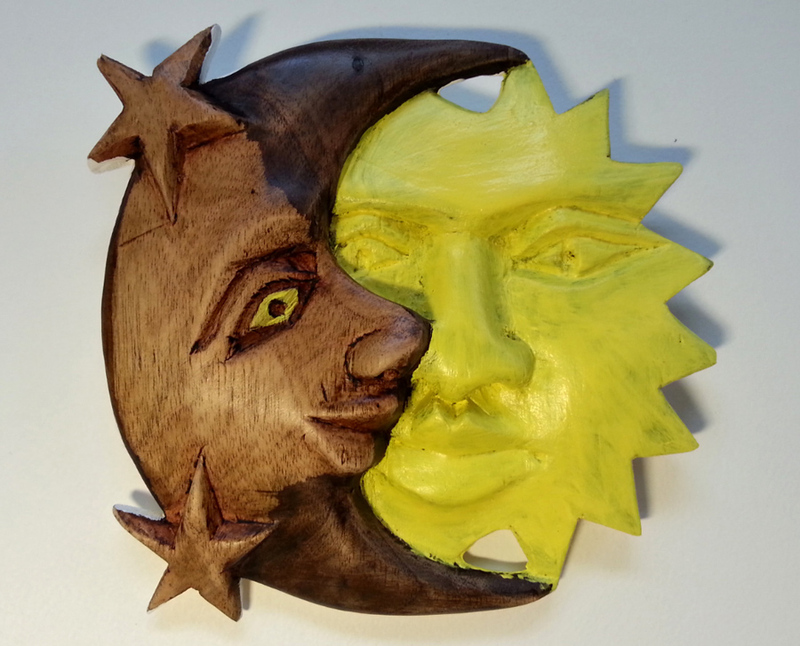 . .
then another coat of yellow for Mr. Sun and a first coat for the stars . . .
some blue for the moon . 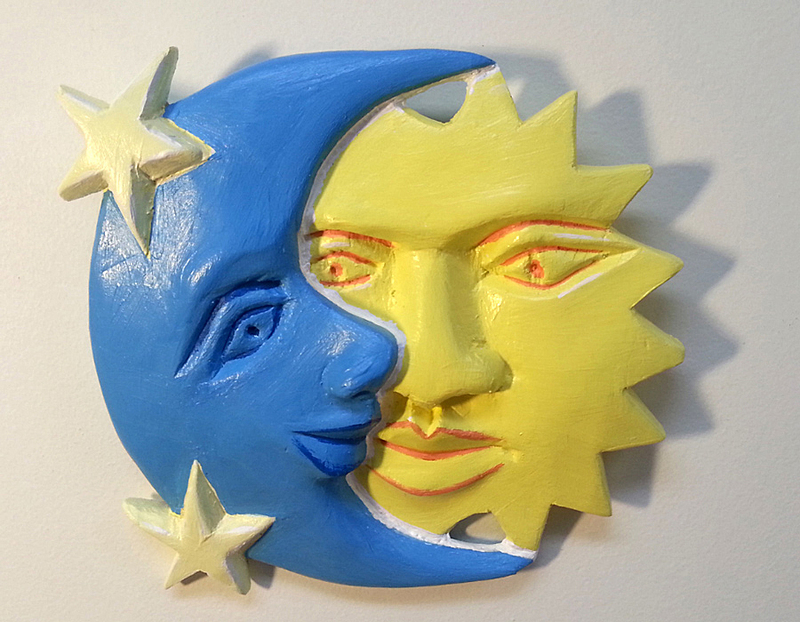 . .
a darker blue for the moon, a bit of detailing . 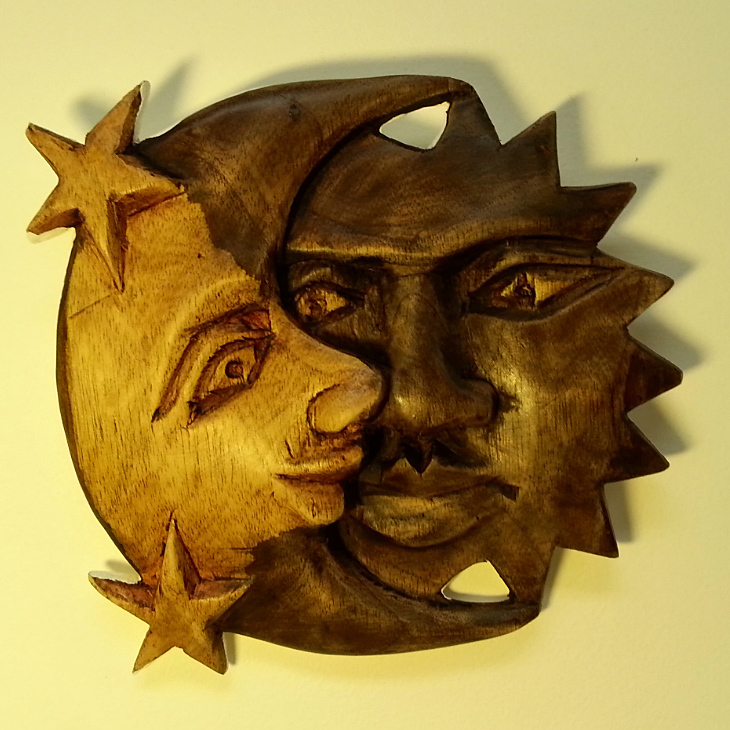 . .
a couple coats of varnish and put it in the garden! And that’s it for August. How has your summer been? 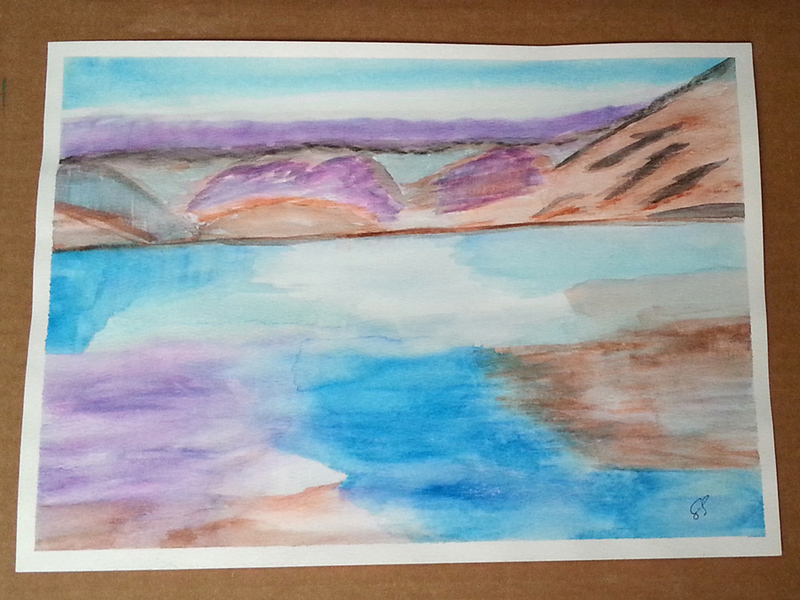 Yesterday, writer Amy Jo Fleming hosted a watercolor painting party for three of her friends—me, Brenda and Leslie. Amy Jo covered her dining room table with plastic. 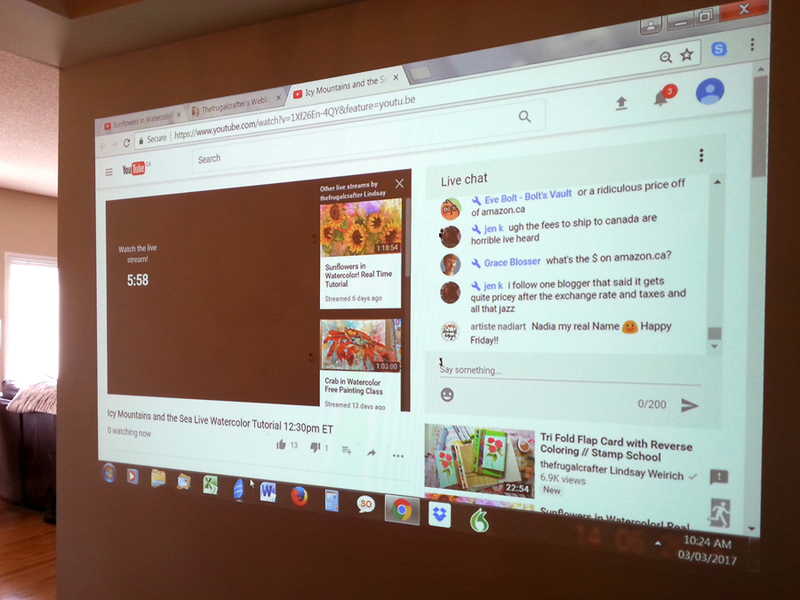 Her son set up a projector, and we watched a live YouTube tutorial by Lindsay Weirich, the Frugal Crafter. 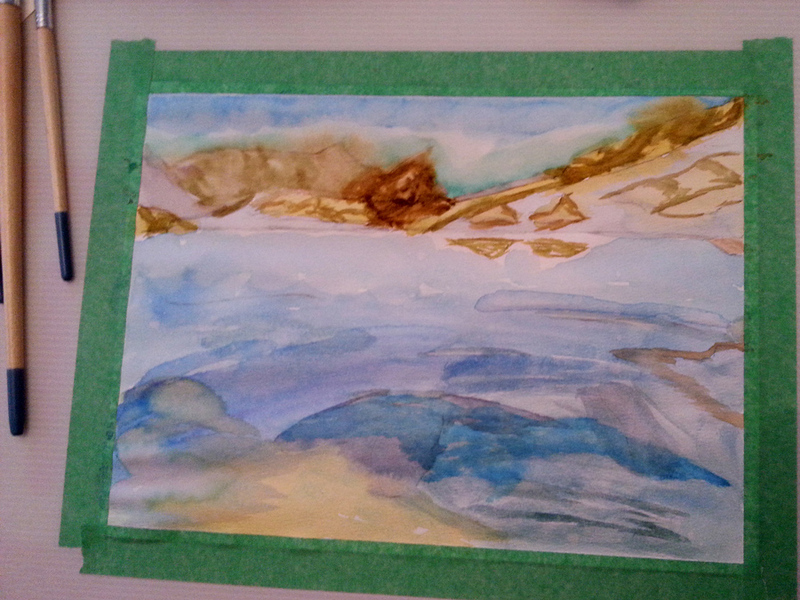 The topic was: how to paint a watercolor scene of “Icy Mountains and the Sea”. 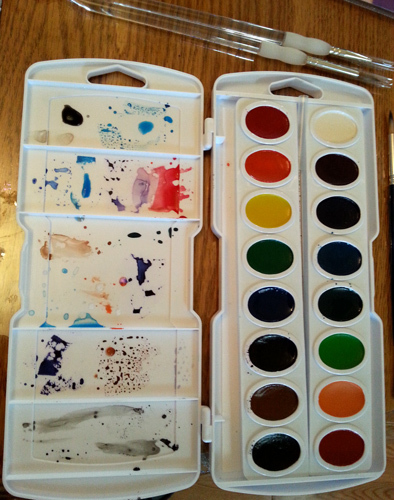 I showed up with my newly purchased paint box and some brushes. Amy Jo gave me a piece of watercolor paper and I was ready. 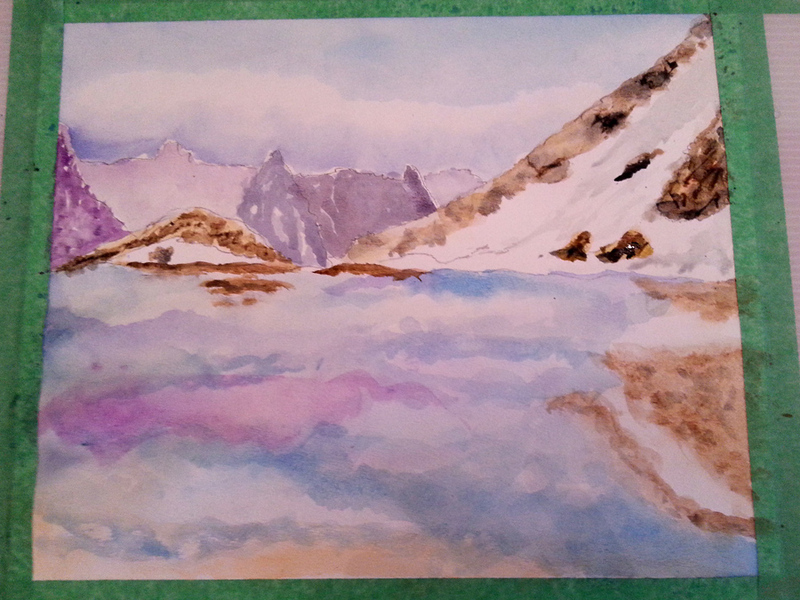 Brenda has done lots of these YouTube watercolor tutorials and she subscribes to Lindsay’s YouTube channel. However, for the rest of us, this was a first effort. Lindsay makes it look easy, and it was an excellent idea to follow along with the live YouTube. Otherwise I think I would have procrastinated all day before putting paint to paper. The YouTube tutorial projected on the wall. As best as I could, I tried to follow Lindsay’s instructions. 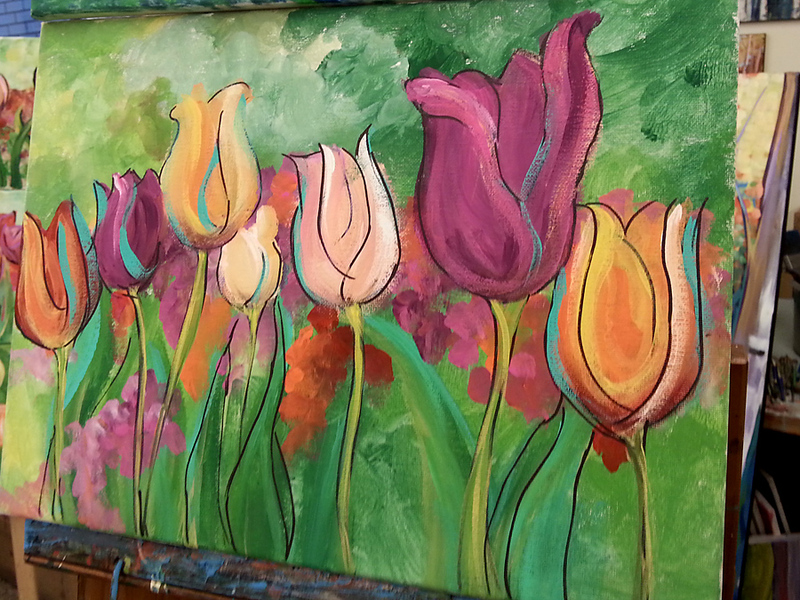 Usually people watch, perhaps get started, and then end up replaying the video to complete their painting. But I followed along, not sure if I was using my right brain or my left brain or any brain at all. I did love the feel of swooshing on color. And sometimes just swooshing on clear water and then dabbing it with a bit of color and watching the color migrate. There are so many techniques to learn, such as scrunching up paper towel and smudging clouds into formation. You also need to learn to blend colors, and to choose colors that bring out the best in each other. A while ago, I showed you my other artistic endeavour, where I painted with acrylics. I can’t say for sure, but I think a beginner would have better luck with acrylics. 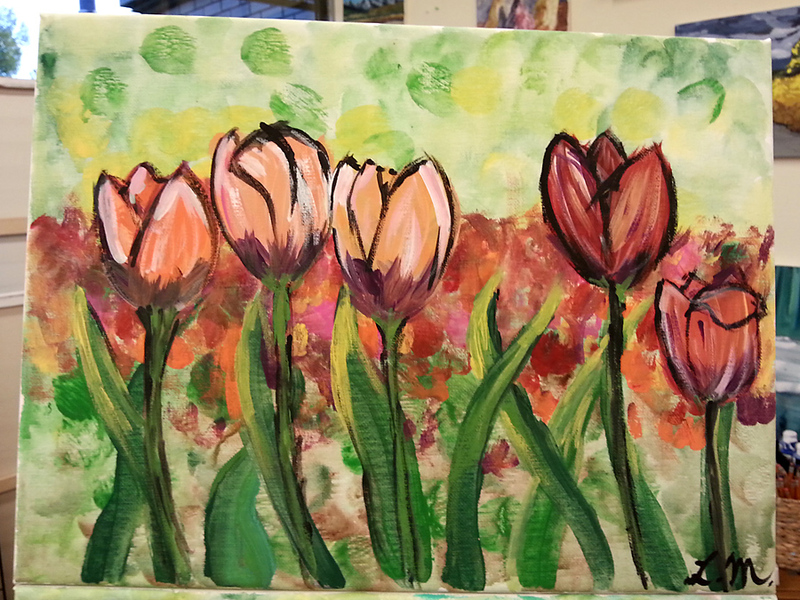 At least, I think my tulip picture here, looks a little better than my landscape. But I’m not complaining. I know everything takes practice. Even if I don’t learn to paint with watercolors, or with acrylics, there is something very soothing about watching someone else paint and gradually transform a blank piece of paper into Something. 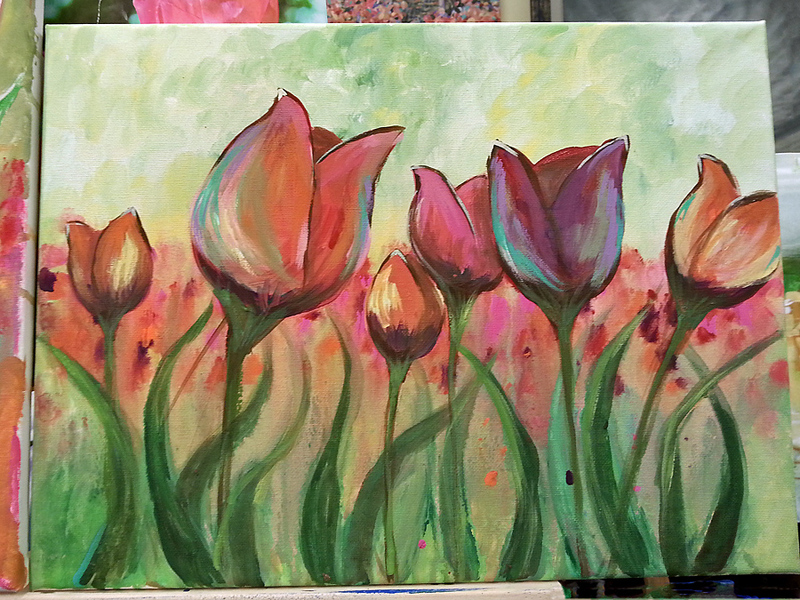 The really nice part about this painting party was the Tea that followed. We potlucked. I brought the one recipe I am capable of – devilled eggs. Brenda, who excels at art and writing, has not yet mastered cooking, so she picked up fruit on the way over. Leslie made scones from scratch and brought jam (Scottish Strawberry) and, of course, clotted cream. 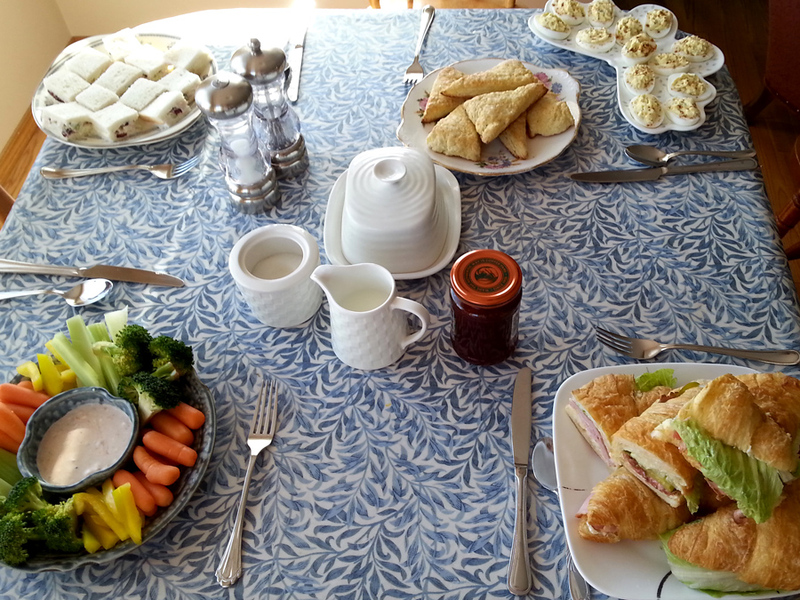 Amy Jo made three kinds of sandwiches including a chicken salad with the crusts cut off. I understand the crusts will find their way into a bread pudding. 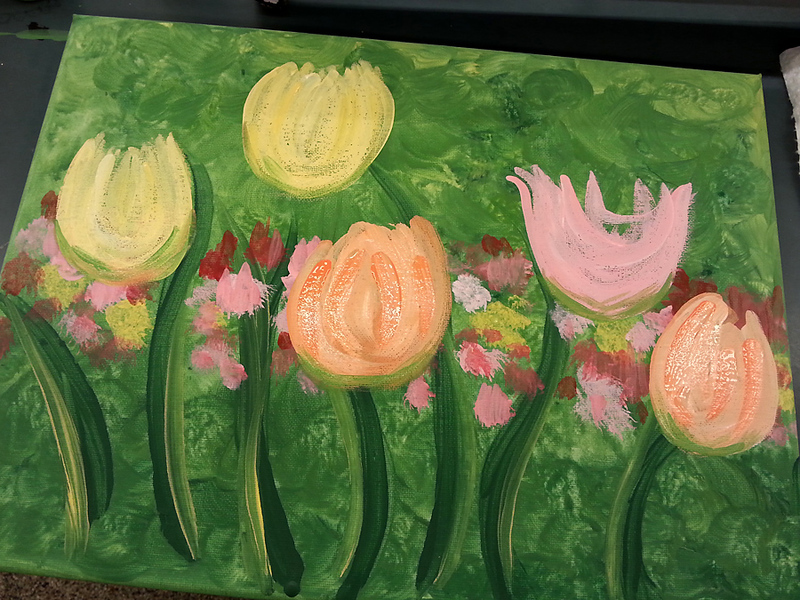 Here are our paintings: First, this is what Lindsay, the Frugal Crafter did, and what we tried to copy. The tutorial is here. She says it is not yet finished and she’s adding more detail at home. 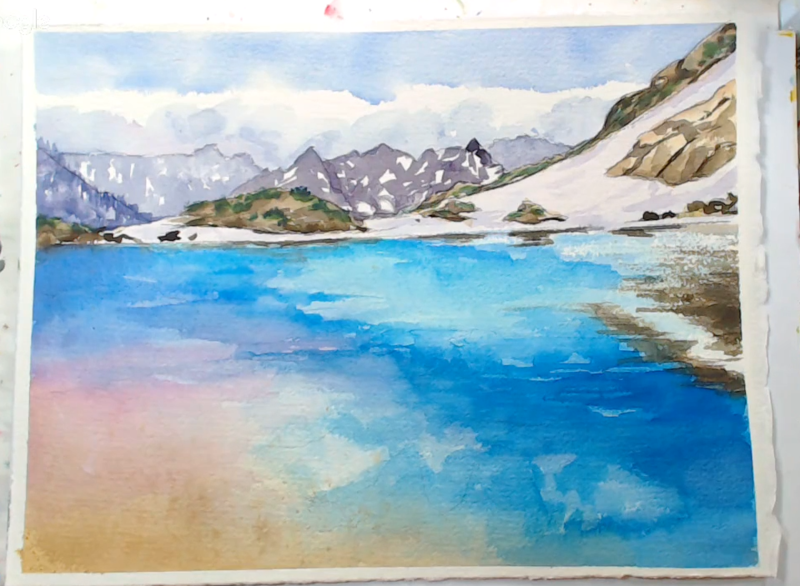 Have you ever painted with watercolor? How about with acrylics? Do you have a preference? 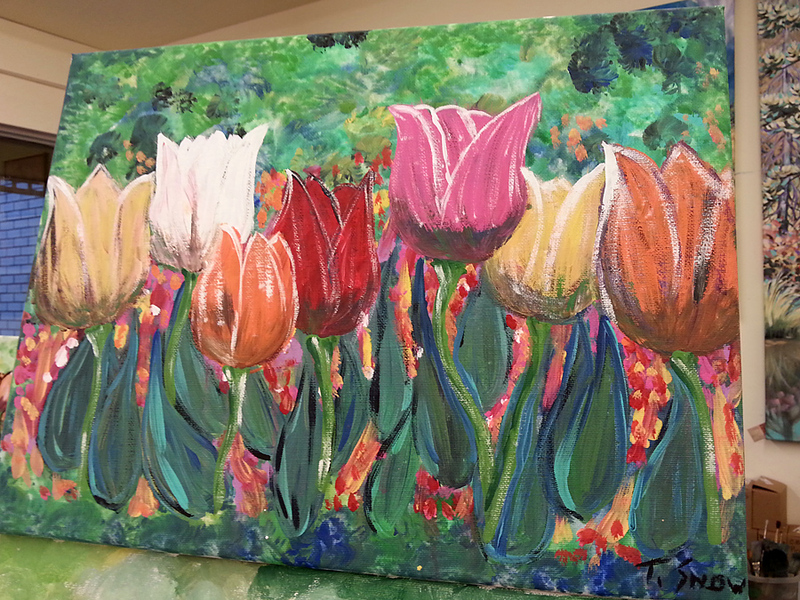 Would you like to have a Painting Party? 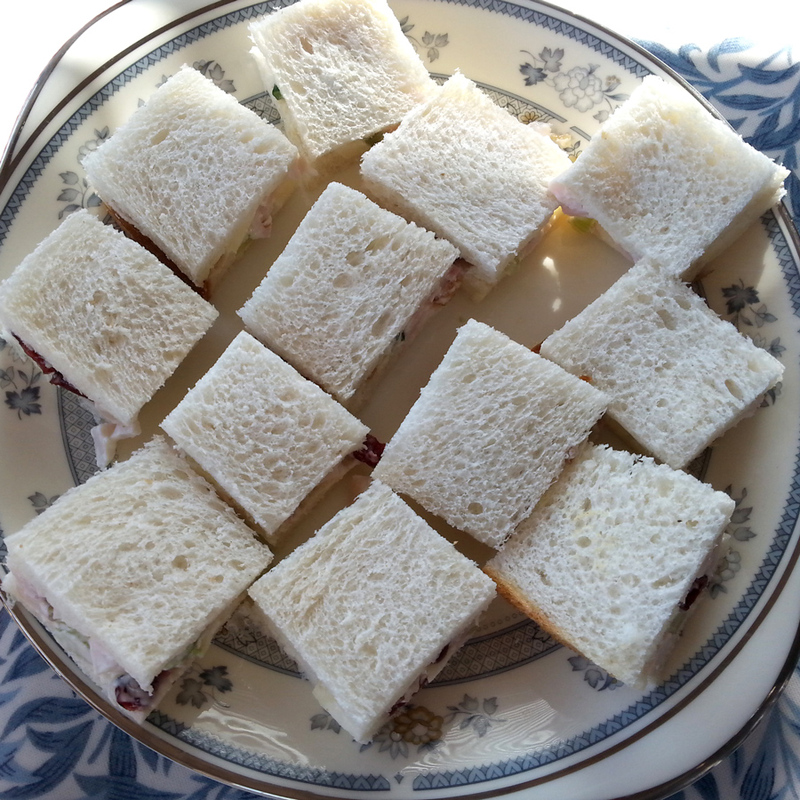 Do you like your Tea sandwiches with the crusts cut off? 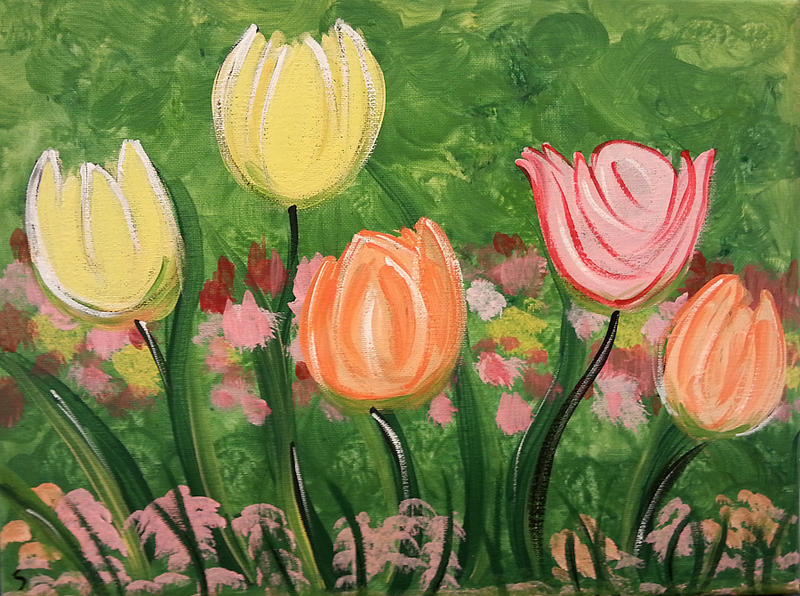 On Friday night, Liz (my D-I-L) and I decided to celebrate Mother’s Day by going to an art class. 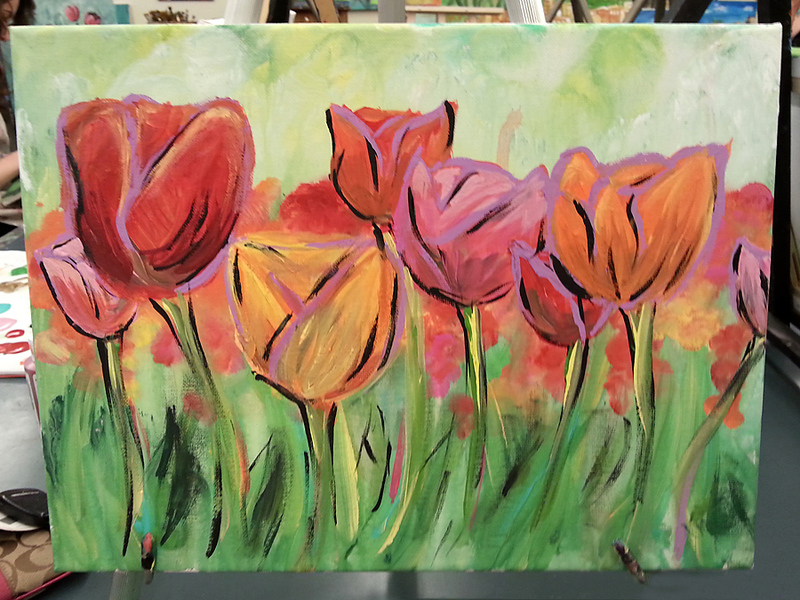 We took our lesson with a group of eight budding artists at the Grasby Art Studio. 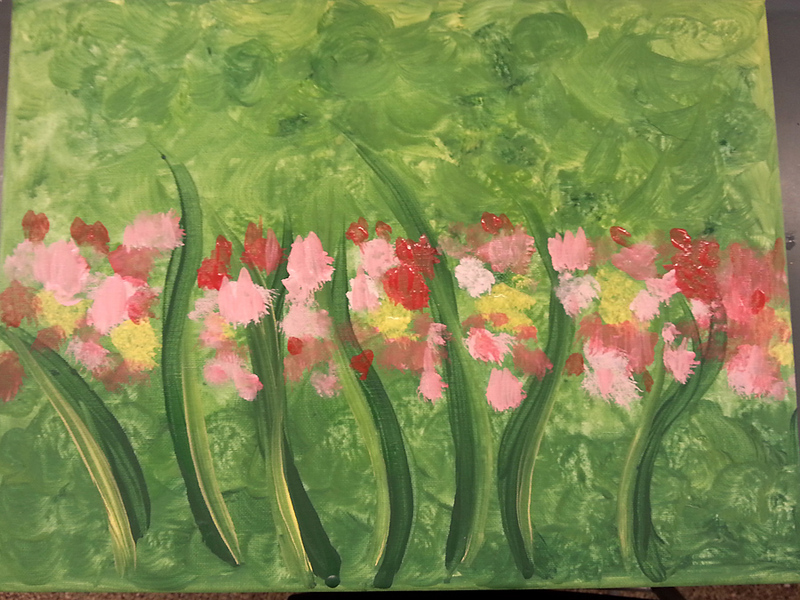 This is the first time I have ever painted a picture. 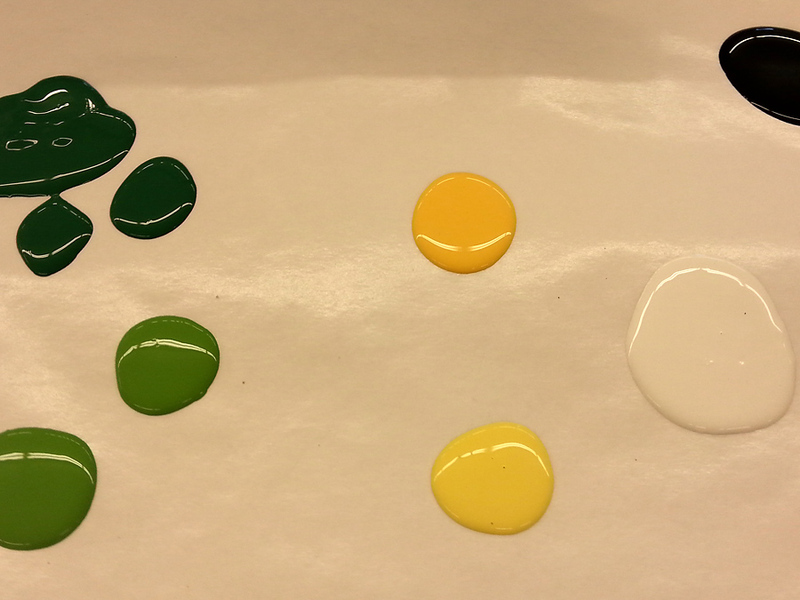 We started by choosing some colours and squirting them onto our “palette”. These paints are called acrylics. We spray the canvas with water . 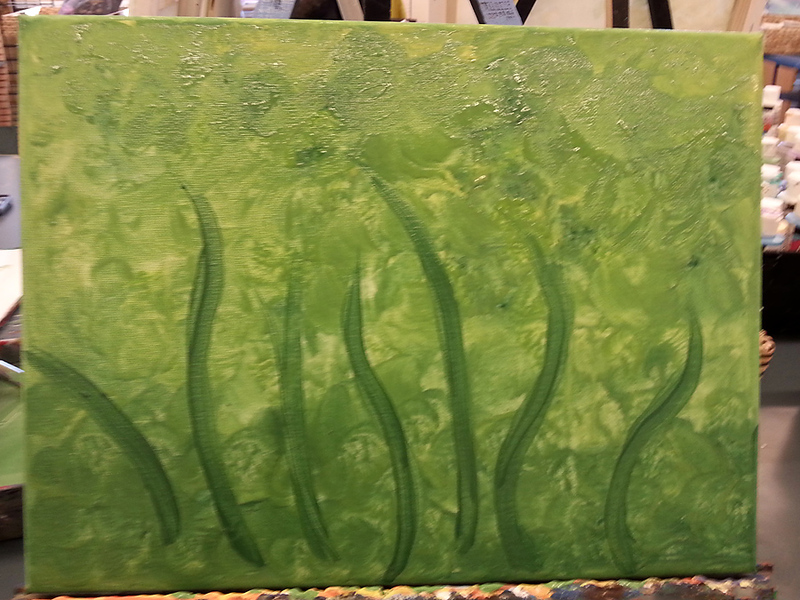 . .
and create a background of greens and stems. Each of these paintings shows its own separate personality. I think this would be an excellent family activity. 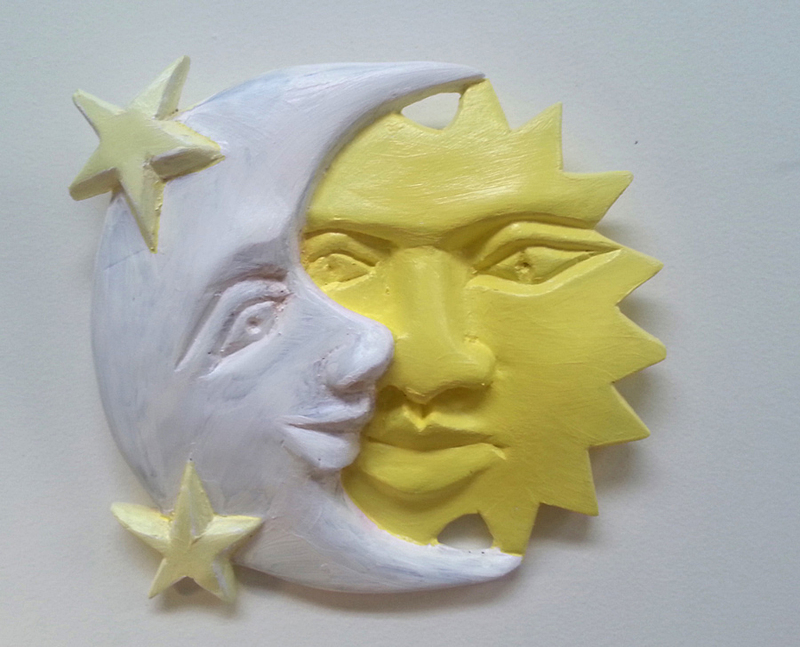 Have everyone paint their own picture and then collect them all and hang them on a feature wall. In this kind of class, there is no right or wrong way to do this. We learned a few techniques and there are many more to learn, but that is for another day. At this point, I am simply happy to begin. I know this is not a “masterpiece” but I am impressed with myself and I want to try this again. What do you think of my first attempt? Have you ever painted a picture? Would you like to try?